Mountain Bikers are NOT advised to ride Crib Goch! A route for Mountain Bikes? Google Maps have excelled themselves this time by suggesting a route up Snowdon for mountain bikers which is dangerous enough for walkers! The Llanberis Mountain Rescue Team were horrified when they found that the knife-edge ridge, Crib Goch, has appeared on the Google mapping tool as a bike route. In their opinion Crib Goch is dangerous enough without trying to ride a bike along it, and will be contacting Google to get the description corrected. 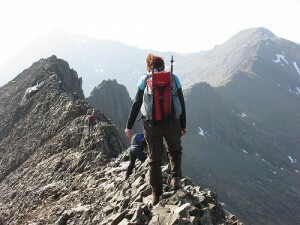 Crib Goch is not even much of a path as the ridge has exposed areas with precipices below – a slip on the higher part would result in a potential 500 ft fall. There are also three pinnacles to go round before you reach the Snowdon Summit. Crib Goch is a known accident hot spot on Mount Snowdon with one or two deaths per year – and experenced mountaineers are included in this number.. The rock is smooth and slippery, the exposed ridge makes walking along it very dangerous in any type of wind. If you’ve not got a good head for heights this is not a good route to attempt! The Snowdonia National Park Authority are trying to get Crib Goch reclassified in guide books and on maps as a scramble, rather than a footpath – on parts both hands and feet are needed. They describe the route as halfway between hill walking and rock climbing – difficult enough for novice walkers, and certainly not suitable for mountain bikes. The recommendation is for walkers who want to try this route to be equipped with climbing equipment, and have climbing skills. With regard to the description of this walk as a route suitable for moutain bikes? Google have stated that people can send feedback via the ‘report a problem’ tool. This entry was posted in Snowdonia by . Bookmark the permalink. Yes your so right you dont want to be riding bikes on crib goch just thought i would ask if you dont mind i’ve climbed quite a few mountains in the last couple of years i’ve climbed scarffel pike snodonia and bennevis just to mention a few and i would like to no if it would be o.k. to climbe crib goch with my dogs as they have always come climbing with me in the past so what do you think yes or no hope to hear from you very soon crib goch looks amazing cant wait to climb it . From what I know of Crib Goch I’d say there’s no way I’d take my dog up there. Haven’t climbed it myself, but some people go over on their hands and knees. The wind can get pretty fierce up there to, and you wouldn’t want a sudden gust to blow them off! If you want to post a question on our FB page you might advice from someone who’s done it. I have taken my dogs up many mountains in Snowdonia,Glen Coe Ben nevis,Cairngorms,Lakes etc. The most challenging being Tryfan, which is classed as a grade 1 scramble in the Ogwen Valley. However Crib Goch is a mountain too far for a dog. Its very narrow,requires,mountaneering skills and in any form of wind is dangerous for humans let alone dogs. Richard and Nicholas Crane must be responsible for sewing the seeds of this idea. They rode mountainbikes along the Crib Gogh ridge way back in 1985, and put a photo of it in their brilliant book, “Bicycles Up Kilimanjaro”. I believe there is mention of taking a Bickerton portable up Scafell or something like that. Visiting Ben Nevis, Snowdon or Scafell Pike this Easter? DFS Sofas complete the Three Peaks Challenge for Children in Need! Today I took part in a Mountain Rescue! Brian on Mountain Bikers are NOT advised to ride Crib Goch! Ady Gray on Should the Three Peaks Challenge Charity Walks be Licenced? Les Towner on Mountain Bikers are NOT advised to ride Crib Goch!